Shop the other so called "OFFICIAL STORE", then call KVAR US. Let us make you a deal you can't refuse. These are 100% US MADE, US PATENTED, UL LISTED, FACTORY FRESH KVAR PFC Units. These are not the cheap dangerous knockoffs or imports you see on the internet. You're using more electricity in your home today than ever before, it's still possible to lower your monthly electric bills with the KVAR PFC Unit. Why are KVAR PFC Units so important? As the demand for the depletion of our natural resources and rising fuel cost for energy increases, so does the need for additional power plants. Our KVAR participants have already saved enough money and energy to help avoid building one additional power plant and saved millions of tons in the emissions from greenhouse gases. How is the KVAR PFC installed? 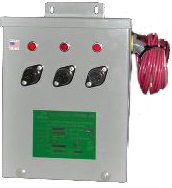 The KVAR PFC Unit is attached to the first 220/240 volt double pole breaker, nearest the main feeds. The KVAR PU1200 will protect up to a 200 amp service panel. We also offer 50, 100 and 400 amp single phase KVAR's as well as 100, 200 and 400 amp KVAR's for 3 phase commercial applications. Homeowners can install these units themselves. By installing the KVAR PFC Unit in this location, you are hitting both sides of the bus bar in your electrical panel insuring whole house surge protection. How do you achieve savings? When motors in your home start, they ask the utilities transformer for power (voltage and amperage) to run. This demand for power runs through the house wiring, thru the panel box, thru the meter and up the lines to the transformer. This demand for power heats up and strains the motors and wiring in the home, this heat (I2R losses) is watts. The KVAR PFC Unit once installed stores and releases to the homes motors what they need to function properly, thus reducing heat on the wires and the motors. Lowering this heat will reduce your electric bill, reduce the chance of fires and increase the life of the motors. 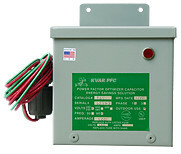 Note: The KVAR PFC Unit is compatible with installation on the "older" designed fuse boxes. The Patented KVAR PFC Unit is a UL/CSA/EPA listed product, has a 12 year residential, and a 5 year commercial warranty and with an average 15% to 20% reduction in kilowatts hours, the investment return can be 12 months or less. Lower monthly power bills, decreased heat dissipation in all inductive load appliances, thus extending their productive life cycle and complete power surge protection for the entire home or office. The beauty of this system is you can take it with you when you move. We even had a customer sell his house for $2000.00 more because he used the KVAR PFC Unit as a selling point! Where can I buy a KVAR PFC Unit? The KVAR PFC Unit is readily available in our office, we welcome your call. Also, the KVAR PFC Unit is available online by clicking the contact link on the nav bar. Tell us what you want and where to ship it. We will ship it to you for free as long as you are in the United States or Canada. All of us at KVAR.US are working harder and smarter than ever to give your family a great energy value and keep your monthly bills as low as possible. Help us help you. Do all you can to conserve and purchase a KVAR PFC Unit! The KVAR PFC Unit increases power factor, by reducing the amount of reactive power (kVAR) that the load draws from the utility company. KVAR PFC Units store the reactive power (kVAR) needed for the creation of the EMF within the inductive load. As the motor operates, this reactive power is "pulled" and "pushed" to and from the KVAR PFC Unit by the motor. The amount of reactive power purchased from the utility company by power factor optimization has been greatly reduced, or eliminated.